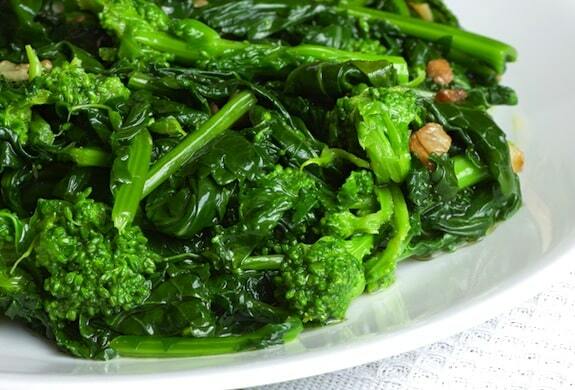 Many people consider broccoli rabe a delicacy, savoring its slightly bitter flavor. Here’s the simplest, most traditional way to prepare it — a quick sauté in olive oil and garlic. And that characteristic touch of sweet raisins to balance the slight bitterness is optional, but do give it a try! 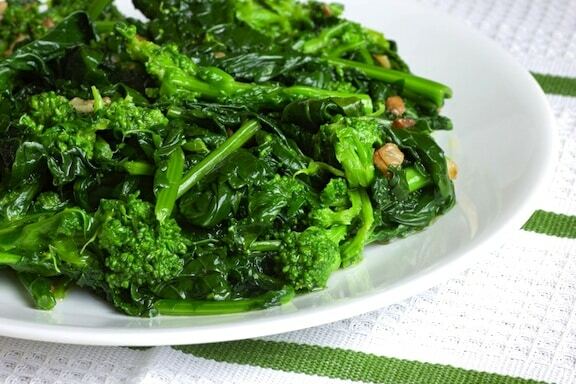 You can prepare chard, kale, or escarole this way as well. Heat the oil in an large skillet. Add the garlic and sauté over low heat for 1 minute, or until golden. Add the wine, then stir in the broccoli rabe. Turn the heat up to medium, cover, and cook until bright green. Uncover and continue to sauté, stirring frequently, until tender-crisp to your liking. Stir in the optional raisins, season with salt and pepper, and serve. Broccoli Raab, garlic scallions and pasta | Sometimes I "Veg"
Hi Anu and Laura,I am grateful for this inartmfoion. My daughter can and will eat only this cheese. I have been having a hard time with her. However Anu if you have a dairy allergy you might want to check the ingredients of the rice cheese which has casien , a milk protein. Cannot want to see Vegan Rella again. My nutrition store is caiynrrg the vegan rella cheddar again and I am still waiting for the mozzerella flavor. Be careful with the Galaxy vegan rice slices. My husband is allergic to dairy and soy and has a reaction to that cheese. Many people who are allergic to soybeans are also allergic to other legumes(peas, beans).